You may have heard of The Dresden Files: it's one of the most popular series in urban fantasy today. (Anyone thinking at this: "Urban fantasy? Isn't that just spiffingly sparkly vampires?" will be dealt with separately...) He's also written the Codex Alera - an epic fantasy that essentially pits Romans with magic against a hostile world of enemies. As well as themselves, of course. He's also one of my favourite authors, and if you haven't at least given him a go, you're missing out.This post, the latest in my 'Why You Should Read...' series, is my attempt to make you do just that - flaws and all. 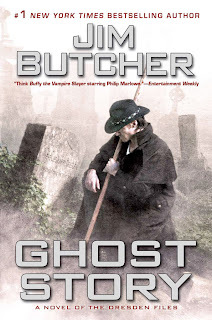 So, why should you read Jim Butcher? - Inventiveness. You might be thinking that that's not much scope for that in urban fantasy where a lot of the real world persists - and you would be wrong in this particular case, but that's not what I'm talking about. What am I referring to? Harry Dresden and Tavi, Butcher's protagonists from the two series, win originally - and inventively. Too many fantasy novels feature a victory of 'x wins because she can make a bigger fireball than y'. Well, that can't happen here: both are limited, and get around said limitations because they make sacrifices, think cleverly, and rarely play fair. (Instead of by divine luck, for instance!) What more do you want? - Genre-crossing. Both series cross genre boundaries - for instance, Dresden Files is detective fiction with a wizard protagonist. It also develops into partial epic fantasy by the late series, so if you're envisaging predictable subgenre tropes: forget it. Of course, there are more - and both series do have their flaws. Storm Front , the first Dresden novel, isn't brilliant, but it's well worth reading to #4 if you think they're decent: there's a lot of improvement. Codex Alera is also lengthier than it needs to be, and a little more traditional than Dresden. But all in all? This is a pretty good summary of why I recomment Jim Butcher to anyone with free time... Or, for that matter, without. I hopped on the Dresden train ultra-late... as in, I just read number 5! Still, I understand exactly what you mean - Harry is acid, fun, fast-paced... And every adventure he wins, he wins by the skin of his teeth. I love him. Up until now, the book I liked less was number 3 - because Butcher dropped Michael on us just like that, and the one thing that gave birth to the whole thing happened behind the scenes! Still, it's a great series and I endorse your recommendation. I'm pretty late to the Dresden files too and I've only read the first 2 books so far. I understand why it was made into a TV series because the stories so far are pretty much self contained and lends itself well to the monster of the week format. I'm still not hooked on the series yet but will continue to read on over the coming months. @ Ron: No 3, really? I'm surprised - most readers pick either #1 or #2 as the low point! Number four, Summer Knight, is where it really picks up, though - and begins to get an ongoing plotline. You've got a lot to look forward to, though! it just keeps on getting better, and there are some of the most amazing moments in UF later on (Dead Beat and Changes particularly). @ Ken: Yes, the first couple are like that. Around books 3-to-4, it develops more of an ongoing plotline - cases are still fairly indivual, but fairly hefty connections and continuities start to appear. Not hooked yet? Read up to Summer Knight, I recommend - if you're not hooked by that, you probably won't be, but #4 is where it starts getting really good. Harry bit more fleshed out as character, etc - he's a little overly exaggerated in #1, especially with the chauvinism, for my tastes.